of wine on many occasions. Etyek is situated in the northeast periphery of Fejér County, at the beginning of the Etyek Hills. 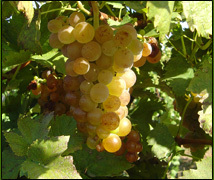 Its natural character is almost identical with that of Champagne. The relatively windy climate with few rains and abundant sunshine and the loessful and limy soil predestine the area to produce special wines. So it is a small wonder that even the Romans were growing grapes in the region, though the today known traditions of viniculture go back to the beginning of the 1700s. Between 1720 and 1770 112 German families were settled in the village, ploughing up devastated lands, eradicating forests and in several decades creating a prosperous agriculture. Etyek became really the vineyard of the capital from the middle of the 1860s. More hundreds of stone cellars were built, the majority of which are still in use today. The special tools of vine-growing, harvest and process were developing and monumental, today still working idol-pressers were set up. Following the turn of the century the wine of Etyek was purchased almost exclusively by József Törley's champagne factory in Budafok, having discovered its excellent quality for making champagne. After World War II the local grape-culture also went through crisis. In 1955 the farm of Hungarovin winery combine was established in Etyek. The 1600 hectares of vineyards extending from Bicske to Pákozd was raised to the rank of wine-region in 1990. The name "Etyek Wine-region" was changed to "Etyek-Buda Wine-region" by the Wine Act of year 1997. The historical cellar group called "Körpince", the Kecske-gödör, the cellar line in Sóskút Road, the unique press-houses, the fascinating vineyards, the material heritages of grape-growing and wine-making, as evidences of past times, can earn our praise for the tradition of wine- and grape-culture.